The recently discovered Bullock specimen of the 1856-O double eagle, graded XF45+ by NGC, is already generating buzz in the numismatic community as the principal draw at Heritage Auctions’ upcoming September Long Beach Auction, Sept. 23-25. This rare 1856-O double eagle, found in family holdings in Ohio, is expected to bring $300,000+. It will be offered to the collecting public for the first time at the September Long Beach Auction. 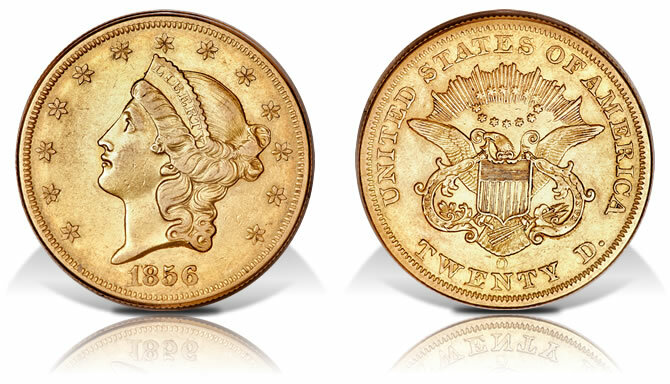 McCloskey went through an extensive verification process to reassure himself that this was a genuine 1856-O double eagle, the rarest and most famous gold coin struck at New Orleans. 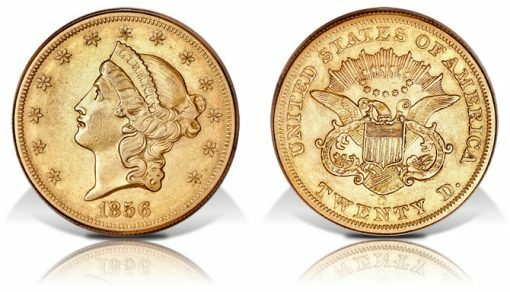 "The Bullock 1856-O double eagle is an incredible coin with an even more incredible story," said Greg Rohan, President of Heritage. "After it was pulled from circulation by James Bullock, a Kentucky farmer, it spent more than 80 years in an Ohio family’s holdings. It was utterly unknown to collectors until John W. McCloskey was asked to examine it earlier this year." Fewer than two dozen examples are available to collectors, even after the discovery of the Bullock specimen. It is estimated at $300,000+. This is the first time it will be offered at auction. Another golden treasure, made around the same time as the Bullock 1856-O double eagle and lost for nearly as long, is a massive 114.65-ounce Kellogg & Humbert assay ingot recovered from the 1857 wreck of the S.S. Central America. It is estimated at $150,000+. 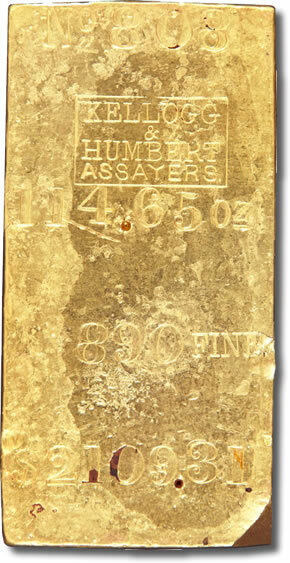 "Gold from the S.S. Central America is popular whenever it comes up in one of our auctions," said Rohan. "The Central America sank in a September hurricane, and her golden cargo was lost, along with many lives. When she was rediscovered late in the 20th century, the same cargo provided a priceless look into the California gold economy in 1857." Many forms of gold were recovered from the wreck, including gold dust, nuggets, small coins carried by passengers, thousands of like-new 1857-S double eagles, and a series of gold assay ingots created by firms such as Kellogg & Humbert in sizes ranging from under 10 ounces to more than 900 ounces. "Most assay ingots were melted when they reached their destination, usually New York," said Rohan. "The S.S. Central America is the source for most California assay ingots available to private collectors and, accordingly, they are hotly contested every time one comes up for auction." The gold of the S.S. Central America came from later in the California Gold Rush, but an 1848 CAL. quarter eagle graded MS61 by NGC, also featured in this auction, was part of the Gold Rush’s beginning. The first discovery of California gold took place in January 1848, and by December the courier sent by the California Territory’s military governor had arrived in Washington with ore and samples totaling 230 ounces of the precious metal. 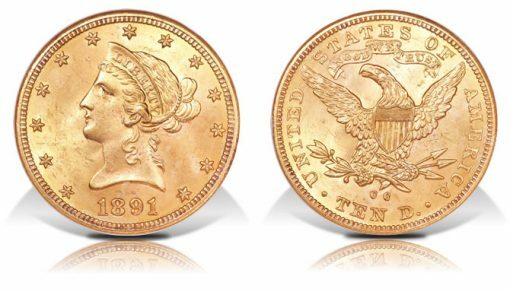 The vast majority of this gold was made into quarter eagles, the smallest gold denomination of the time, and each coin was hand-punched with the inscription "CAL." (for California) just after striking. Because of the metal’s origin and the coins’ inscription, many numismatic scholars consider the 1848 CAL. quarter eagles the nation’s first commemorative coin. This MS61 example is estimated at $80,000+. While high-end gold is well-represented in this auction, silver collectors also have plenty of high-profile selections to consider, such as a 1796 half dollar with 16 Stars obverse, O-102 variety, graded VF25 by PCGS. The half dollars of 1796 and 1797 form a short-lived and rare type, combining a Draped Bust obverse with a Small Eagle reverse. All four die varieties of the 1796-1797 half dollars are rare, regardless of grade, and the supply of the type as a whole is far less than demand. This midgrade O-102 1796 half dollar is estimated at $75,000+. One of the most impressive Featured Collections in the auction is The Bob Simpson Collection of Seated Dimes. An 1874-CC Arrows dime graded AU50 by PCGS with CAC label is the most important piece in the collection, estimated at $60,000+. The mintage of 1874-CC dimes, all of which show arrows flanking the date, barely reached five figures. Of the 10,817 pieces made, the vast majority were lost or worn to oblivion. Most survivors are exceedingly worn, and high-end circulated examples, such as the AU50 Simpson coin, are condition rarities. While every Heritage auction has its share of one-of-a-kind items, the most distinctive lot on offer in Long Beach is a remarkable 15-item archive of material related to James Madison Hunnicutt, Jr.’s service on the 1963 Assay Commission, charged with assessing the weight and purity of U.S. coinage. At the center of the archive is Hunnicutt’s 1963 Assay Commission silver medal, 57 millimeters in diameter, with his name inscribed on the edge. The archive offers singular insight into the workings of the Assay Commission just before the passage of the Coinage Act of 1965, which removed silver from most U.S. coinage and eventually led to the end of the annual Assay Commision. Lot 3094, 1811/0 S-286 cent MS63 Brown NGC, CAC: The single finest example in the combined certified population, previously in the James A. Stack Collection and used to illustrate the 50th Anniversary Edition of the Guide Book. Estimate: $40,000+. Lot 3126, 1856 Snow-3 Flying Eagle cent PR65 PCGS, Eagle Eye Photo Seal: While this example is graded as a Gem Proof, the Snow-3 pattern 1856 Flying Eagle cent is thought of as a business strike by specialists. Part of The Westmoreland County Collection, Part Three. Estimate: $40,000+. Lot 3843, 1926-D dime MS67 Full Bands PCGS Secure, CAC: One of just three MS67 Full Bands examples of the date certified by PCGS with none finer, a gorgeous coin of tremendous importance to Registry collectors. Estimate: $45,000+. Lot 4759, 1895 Morgan dollar PR64 Deep Cameo PCGS: A stunning Deep Cameo specimen of this legendary proof-only issue, one of just 880 pieces struck. Estimate: $50,000+. Lot 5471, 1891-CC Liberty ten dollar MS65 NGC: The single finest known 1891-CC ten dollar coin and one of the three finest CC-mint eagles regardless of date. Part of The Dr. Mani and Kay Ehteshami Collection. Estimate: $60,000+. i have a 1880 ten dollar gold dubble eagle S.